This is the interior of the Palace Billiard Hall, 300 Missouri Street, Alma, Kansas. It offered pool, billiards, cards, and drinks to Alma men. Conrad Mueller owned this building as well as his hardware store next door at 304 Missouri Street. 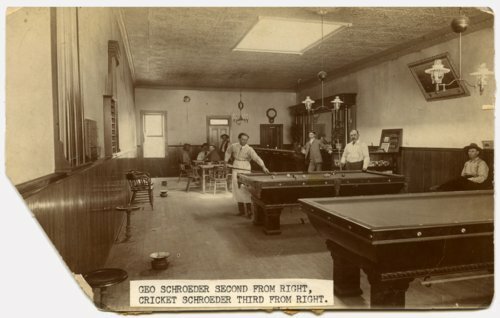 The photo shows tin ceiling tiles, spittoons, billiard tables as well several people playing pool. There are four other people around a table in the back. Plants are on both end of the bar at the back of the right side of the image. Geo Schroeder is second from the right and Cricket Schroeder is third from right.